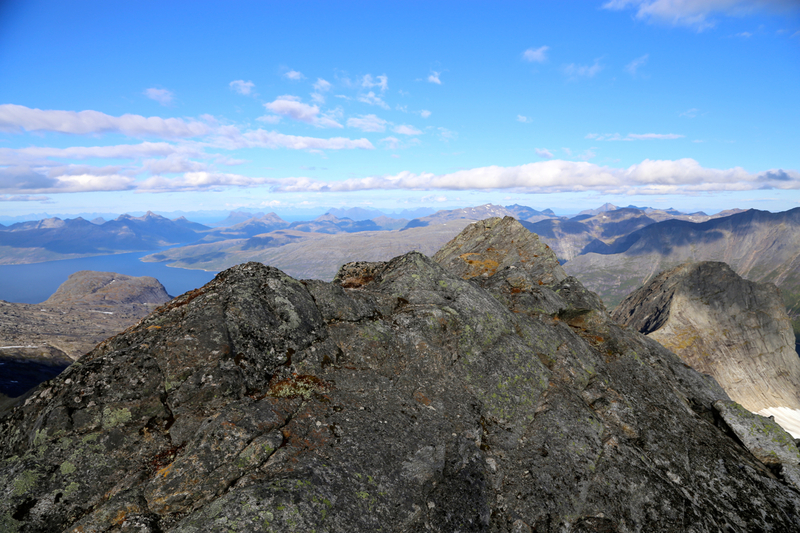 This mountain is located on the border between Steigen and Sørfold. 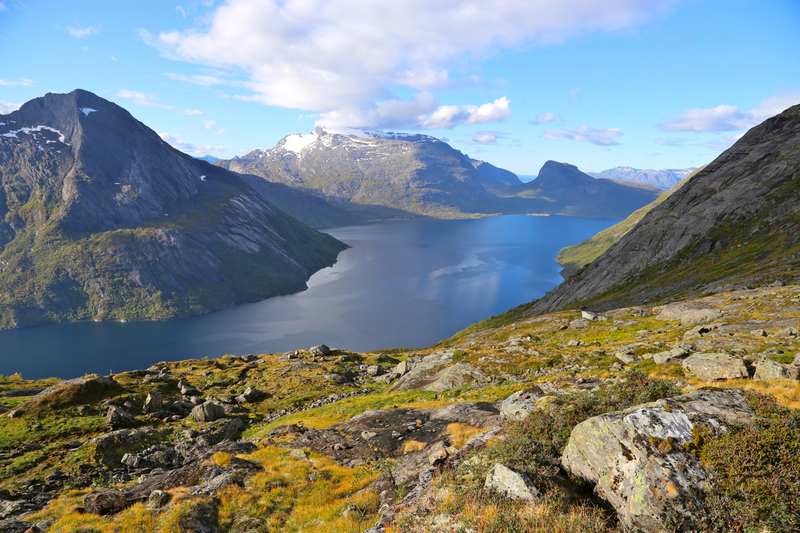 More precisely, it is located between the Stavfjorden fjord and the Mørsvikfjorden fjord. The mountain has no name on the M711 maps and the locals living in Steigen did not know a name either. 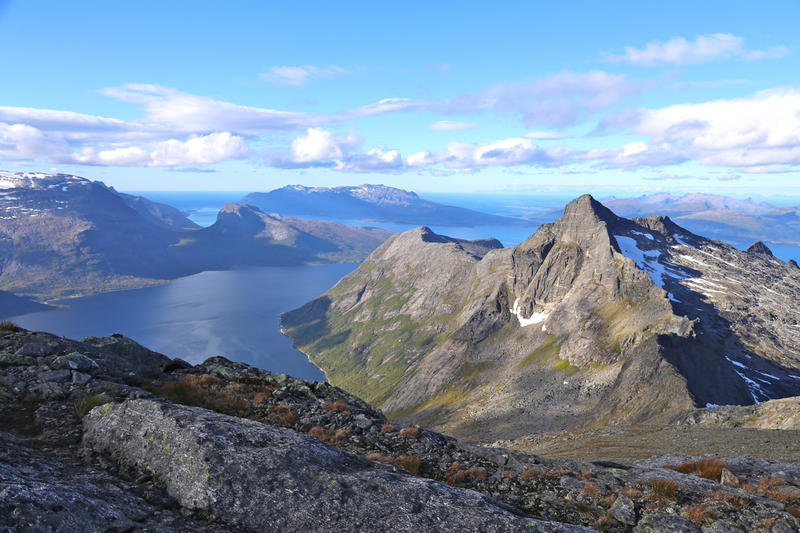 The mountain is located on a ridge that extends south from Reinviktinden (1117m) and then continues from the summit, further south to Ingerbakktinden (1190m). 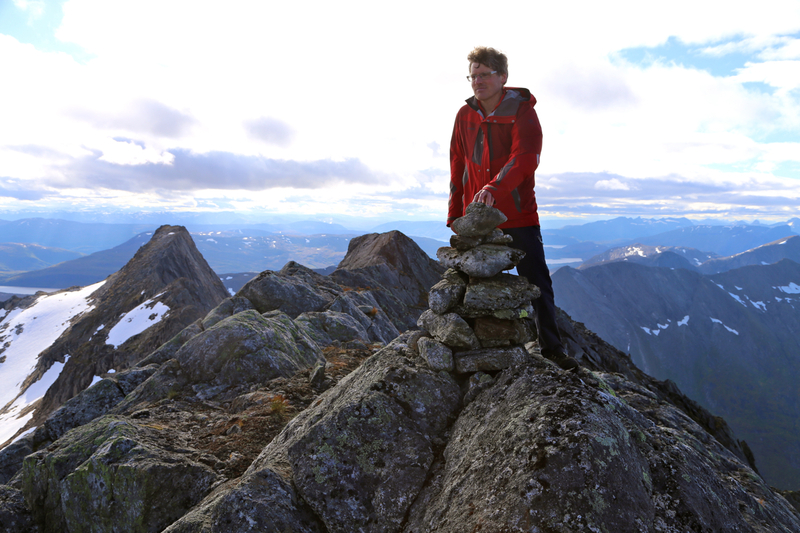 Kjetil Hansen has lived in the area for more than 70 years, he claims that nobody had visited this peak before. 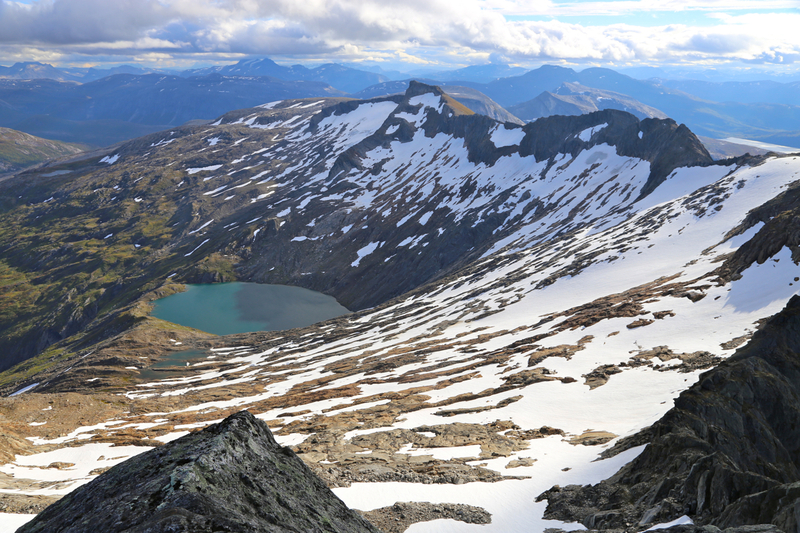 However, the peak is the highest in the area and it has more than 1000 meter of prominence. 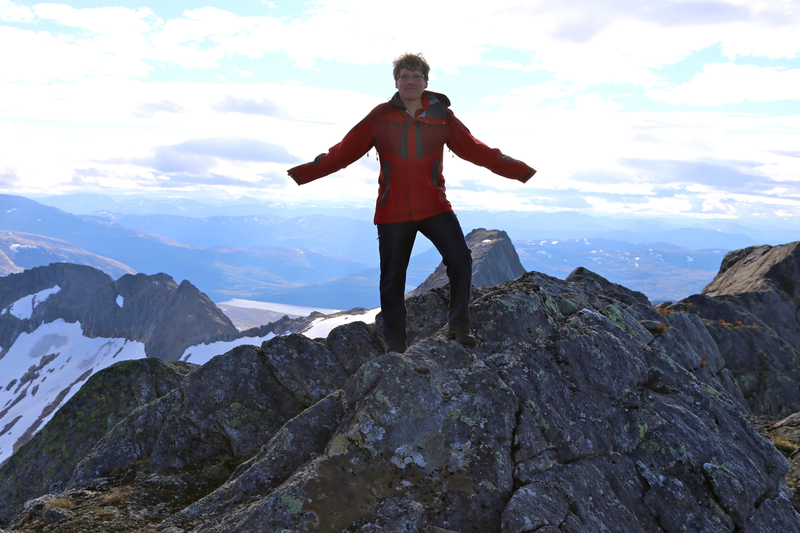 I found no information about this peak anywhere, thus it might just be possible that it had indeed never been climbed. I had researched this question quite extensively. 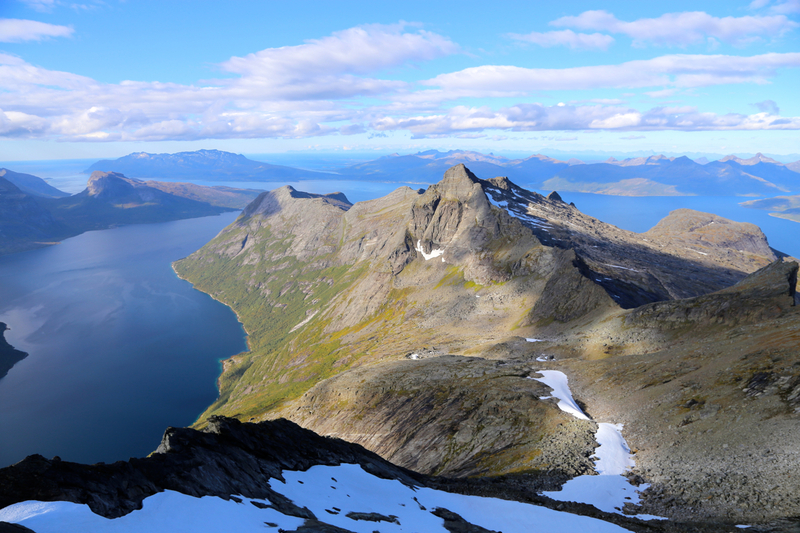 In particular, when taking a boat back to Nordfold after climbing Helldalisen in 2014, I asked the boat to make a detour in order to get some high resolution pictures of a possible route. 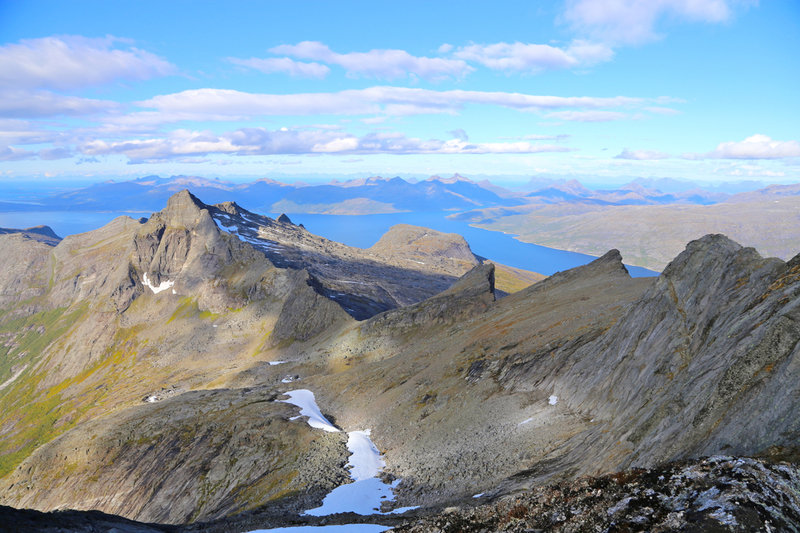 Thus, one possible approach is to drive to Nordfold in Steigen and organize a boat transport from there to Stavfjorden. Start at the coast, location N67.72018, E015.54841. From here, head uphill until cliffs, then follow below while ascending to your right. Our route went by location N67.72278, E015.55864, at elevation 200m. Then continued to location N67.72303, E015.56280, at elevation 300m, and further uphill to elevation 400 meter at location N67.72325, E015.56633. 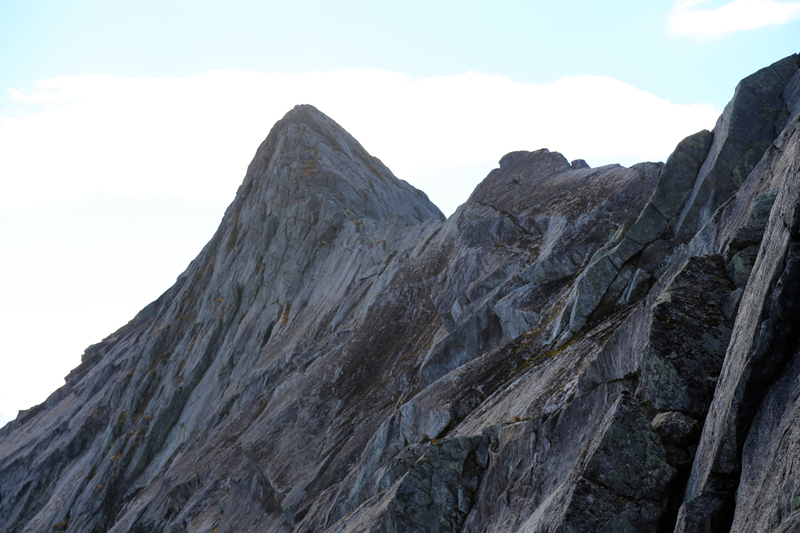 In general, the best guidance is to follow below the cliffs more or less all the way up. 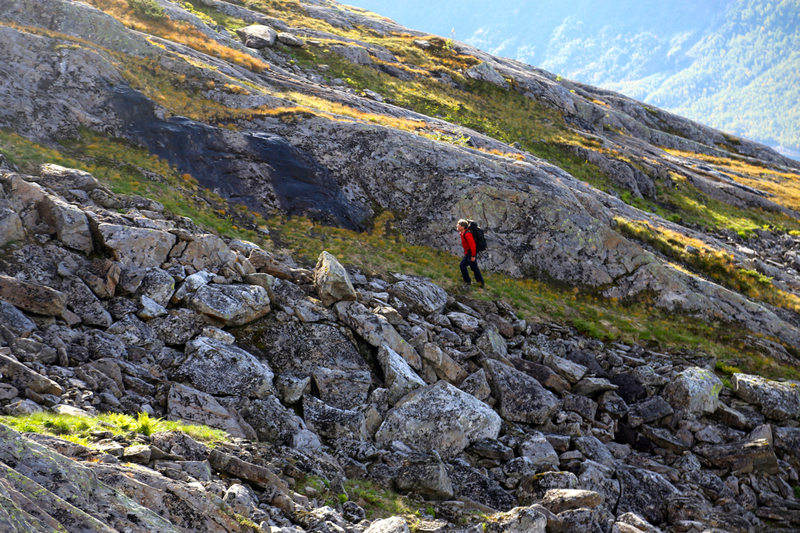 The vegetation is not bad close to the rock and in this way one also follows near the best overall route. This picture shows an outline of the route. 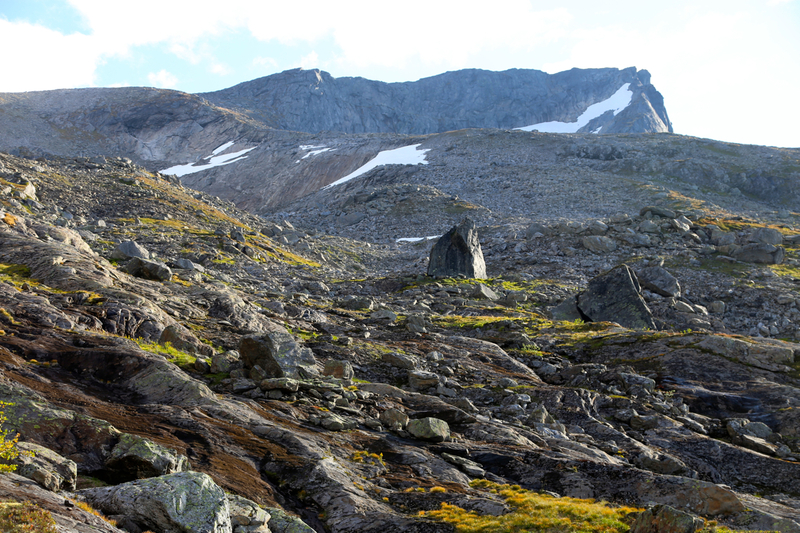 Above 400 meter, the terrain is more gentle and it is easy to pick a way onwards. 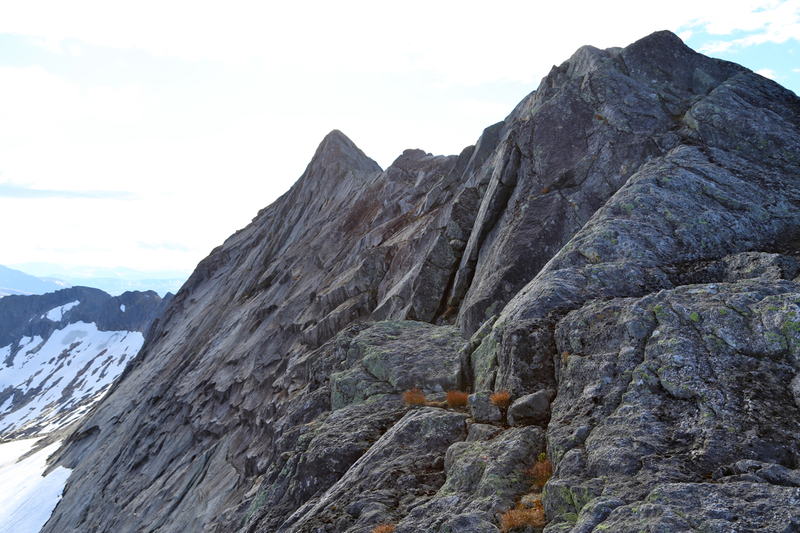 Aim for the ridge that runs down from the summit ridge on the left side of the summit. A good line will pass by two big rocks along the way. 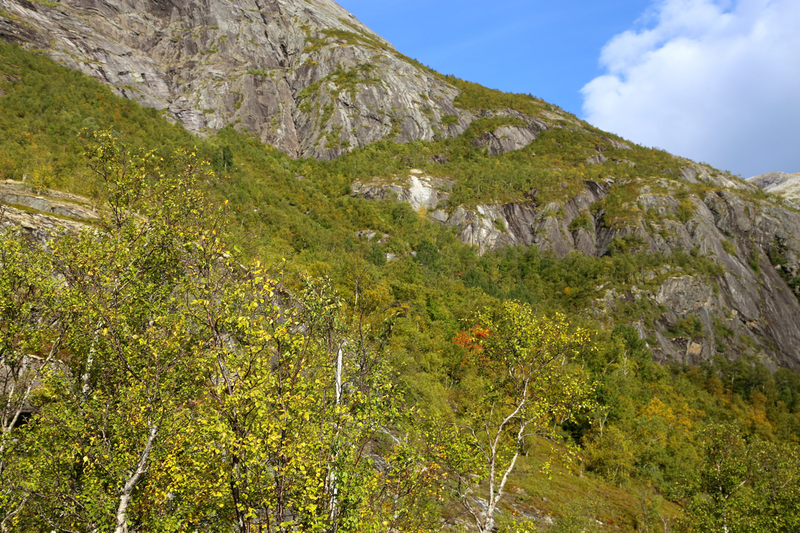 Ascend onto this broad ridge, then follow it to the top of the ridge. 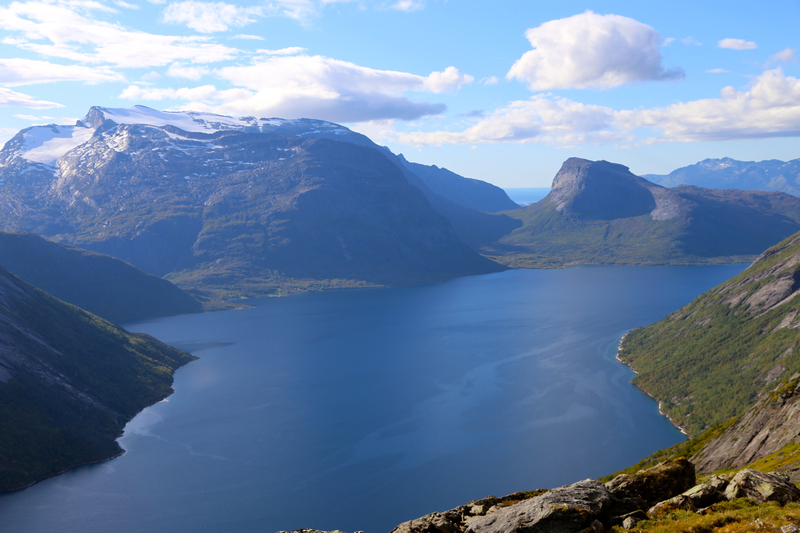 From here, the main crest, a new view opens up across Mørsvikfjorden (east). To this point, the route has been (YDS) class 2. 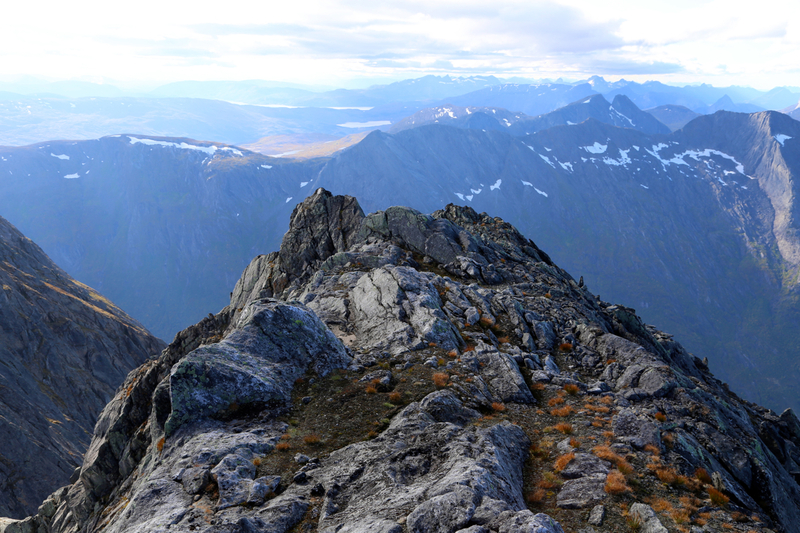 From here to the summit, requires easy scrambling (YDS class 3) along a sometimes airy ridge. However, this should pose no difficulties when the conditions are reasonable (no ice etc.) 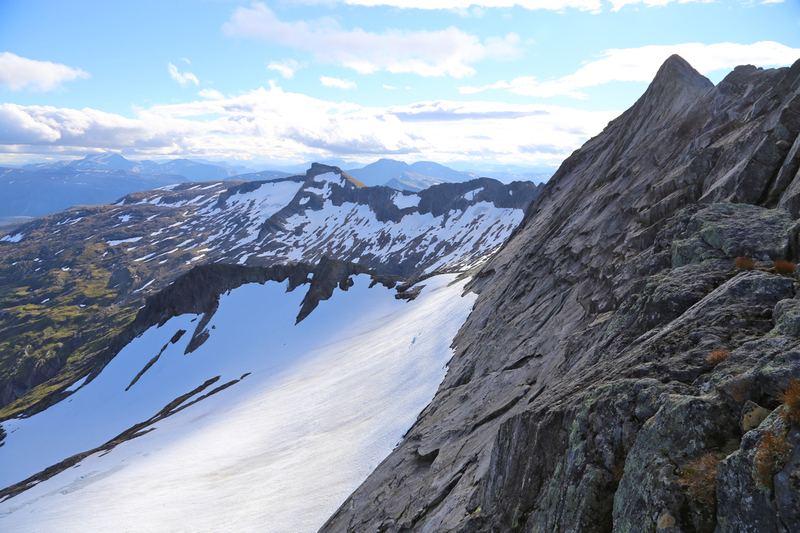 First, follow along the ridge, next do an easy down-climb following a big crack. The next section is a bit protected and is just a nice walk. 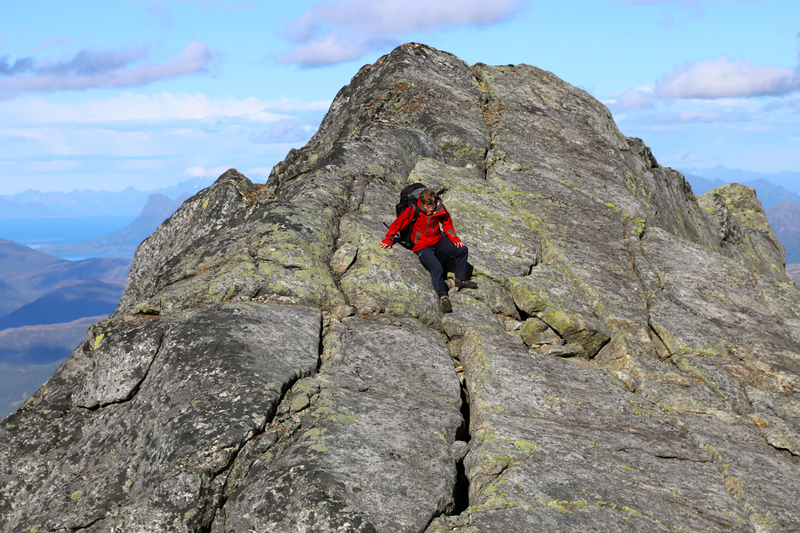 The last part of the ridge has a couple of narrow spots, none are difficult as long as one is careful. 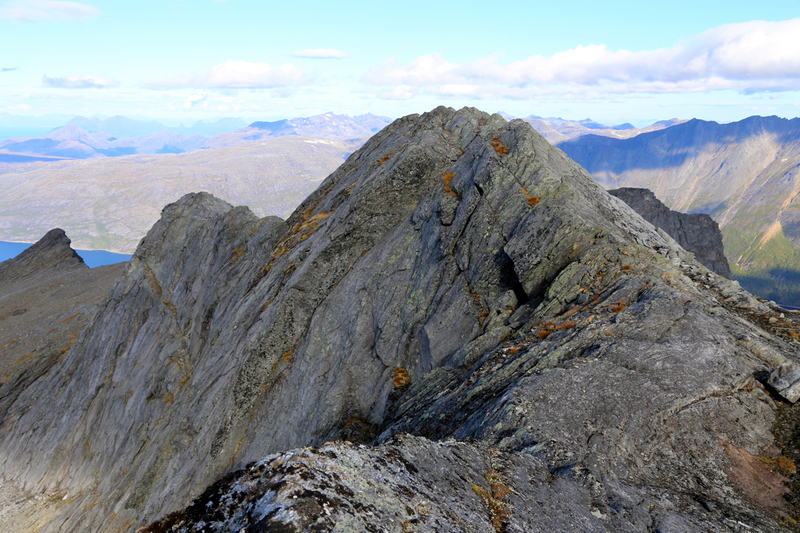 The summit itself is located directly on the top ridge. A bit further on is another local bump, but it is lower than the first summit point. 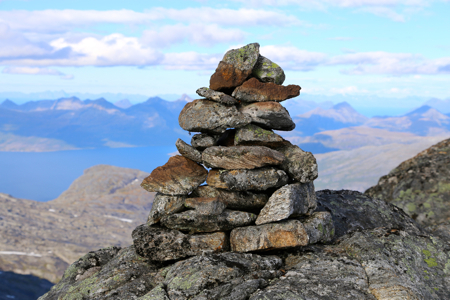 You will locate the small cairn that we built near the highest point of the ridge. 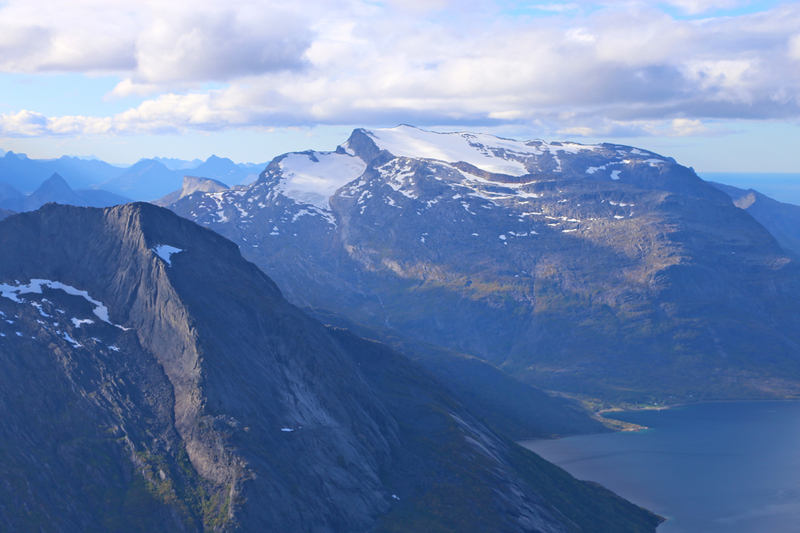 This mountain had been a bit mysterious ever since it entered my list of peaks in Norway having at least 1000 meter of prominence. It soon became clear that there were no information available on the internet. In short, I was unable to find any reports or documented climbs. Access looked difficult, as a boat was almost certainly required. 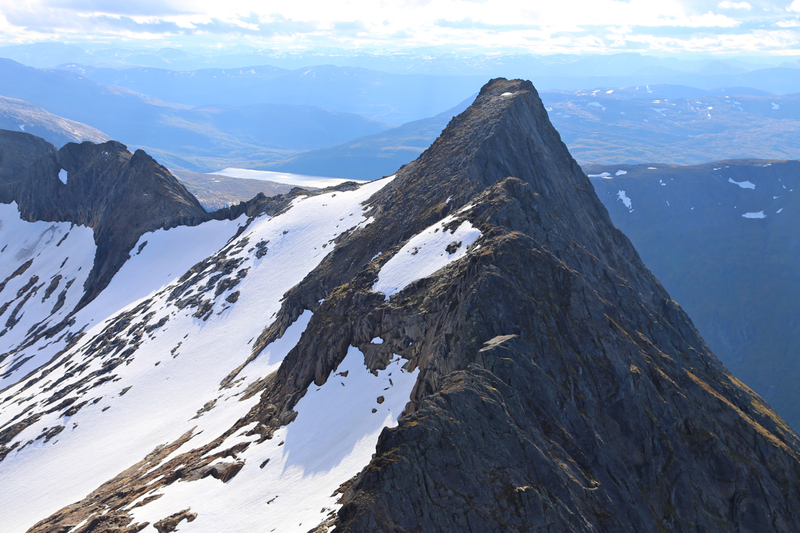 In the beginning, I called this peak Reinviktinden, however after my visit in 2014 when I climbed Helldalisen, I became aware that Reinviktinden is located North-East and that Reinviktinden is only 1117 meter high. My friend Åke and I arrived late in the evening before. We stayed with my very hospitable friends Nina and Agnar in Bogøy, then met our boatman Kjetil in Norfold at 0800 the next morning. The boat trip went smoothly and we stepped ashore around 0900. 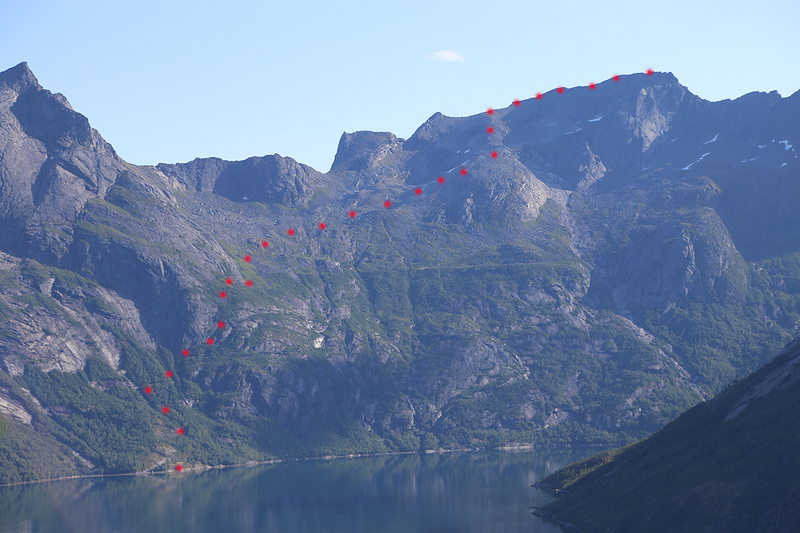 The first challenge would be to find a route uphill avoiding all the steep cliffs that could be seen from below. Progress was fine and we gained the first 400 meter of elevation in one hour. 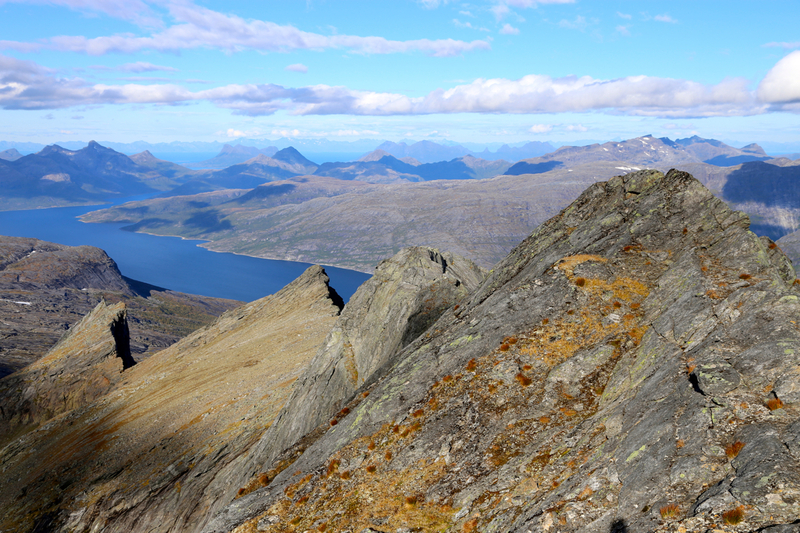 From here, there is already a nice view back down at the fjord with Helldalisen very prominently across. The weather was also nice and it was exciting to explore a completely new route. 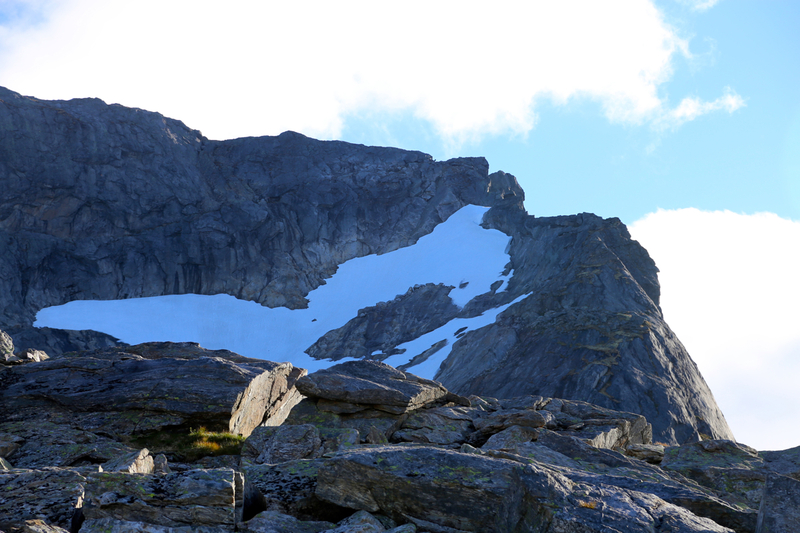 We agreed that the ridge looked most promising, but that the snow on our right followed by a scramble would be our backup plan. 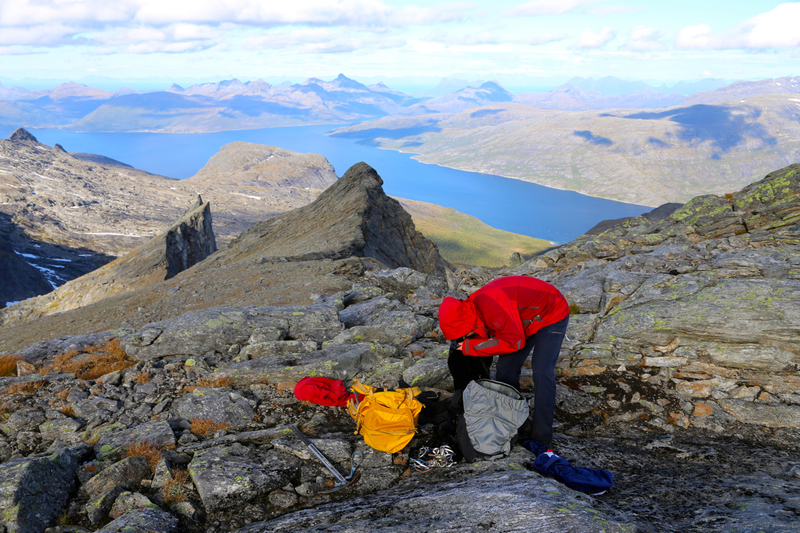 We made the main crest around 1145, left one backpack and quite some gear there. 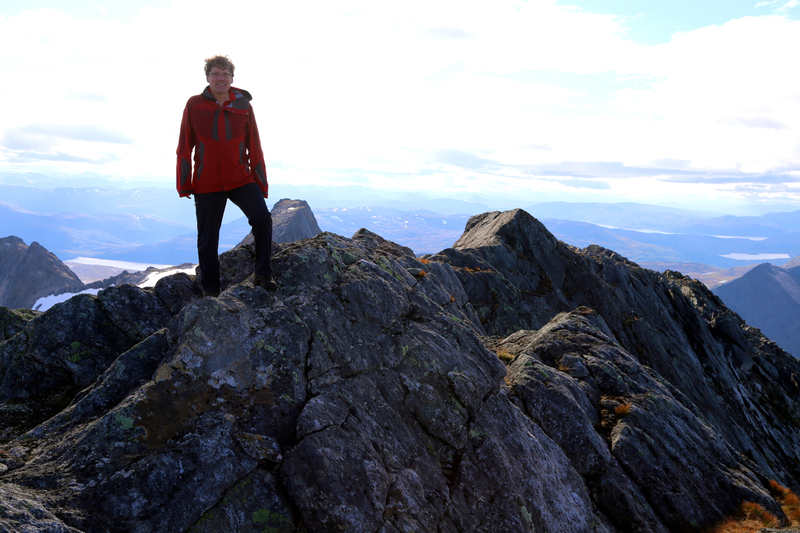 From this spot, the summit looked a bit challenging, but overall not bad. We scrambled along and within about 15 minutes we were both standing at the highest point. No sign of any previous visit could be seen. 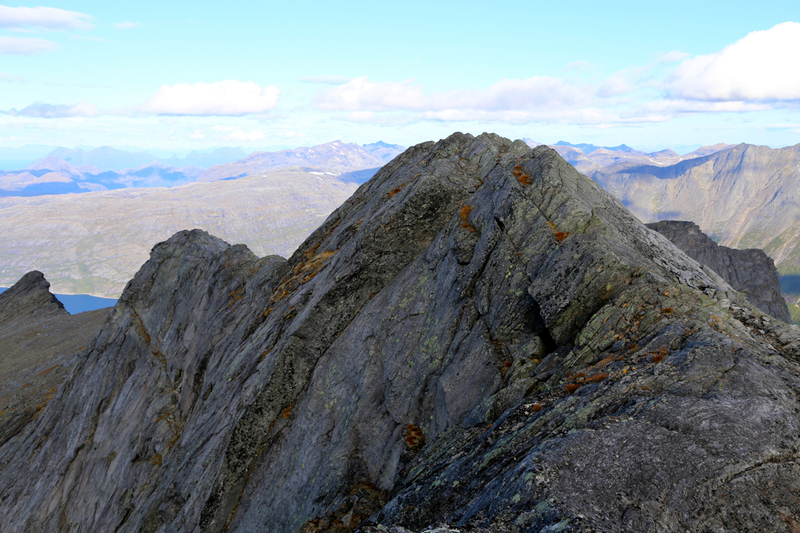 Looking back, the ridge we just traversed is sharp, but very smooth. 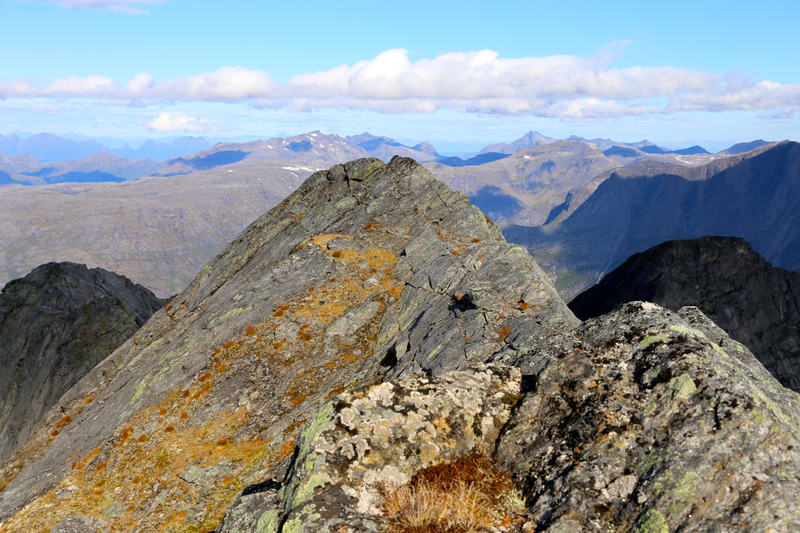 We continued along the ridge to the next small hump (clearly lower), from here the ridge drops off. 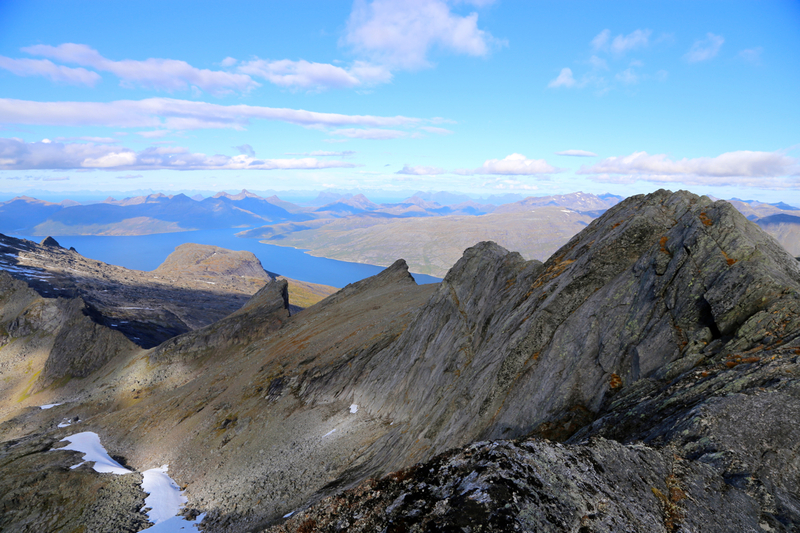 We took a photo looking back at the summit from there, before returning to the highest point. 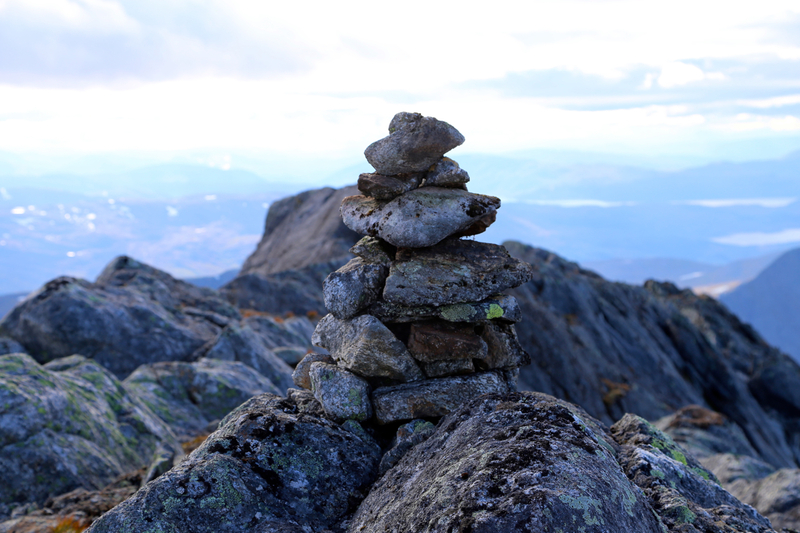 We next spent some minutes to build a small, nice-looking cairn. The weather stayed nice and the scenery is absolutely stunning. 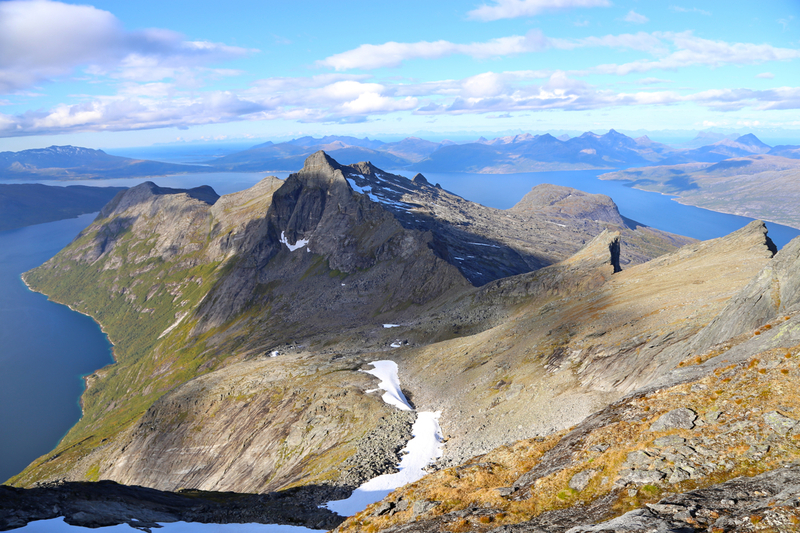 Sharp ridges, the Helldalisen glacier, the blue fjords, distant peaks across in Lofoten, all coming together - the making of a complete landscape. We left around 1230 and had a nice return hike pretty much following the same route. 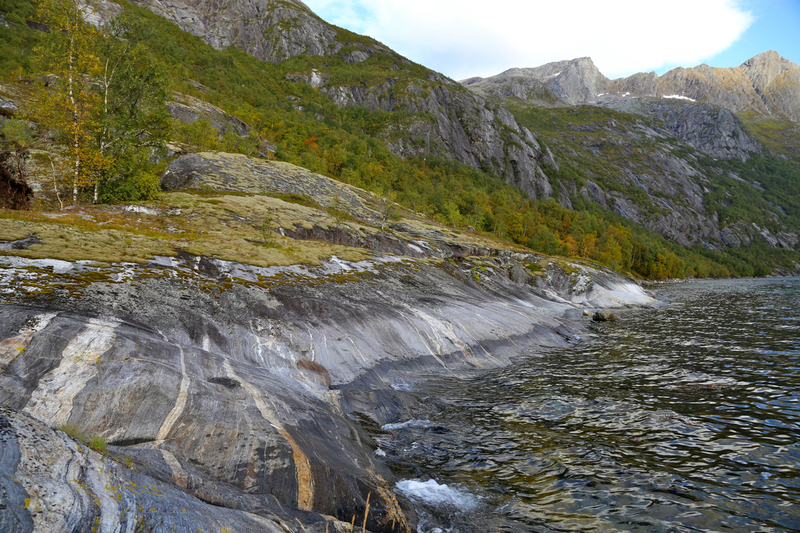 Back down by the fjord at 1545. Ketil showed up at 1615 due to somewhat rougher sea. Altogether, a very memorable day in a spectacularly scenic landscape. 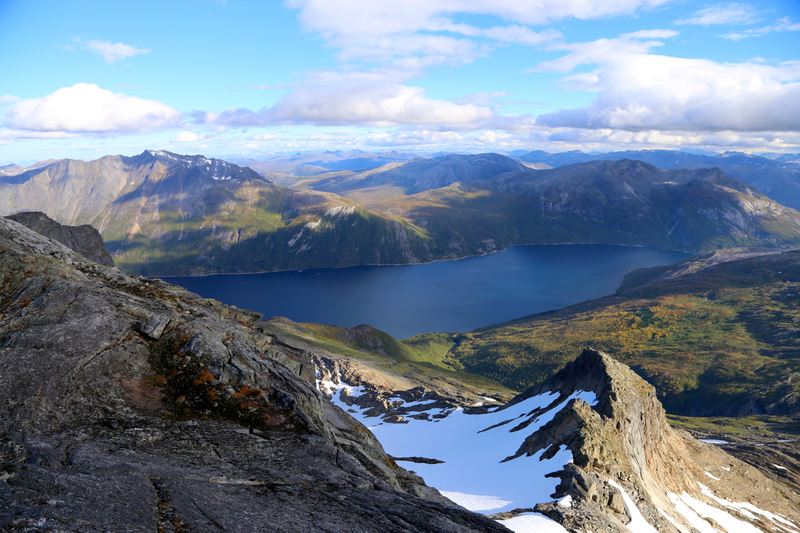 Lake Dalvatnet, as seen from the summit. 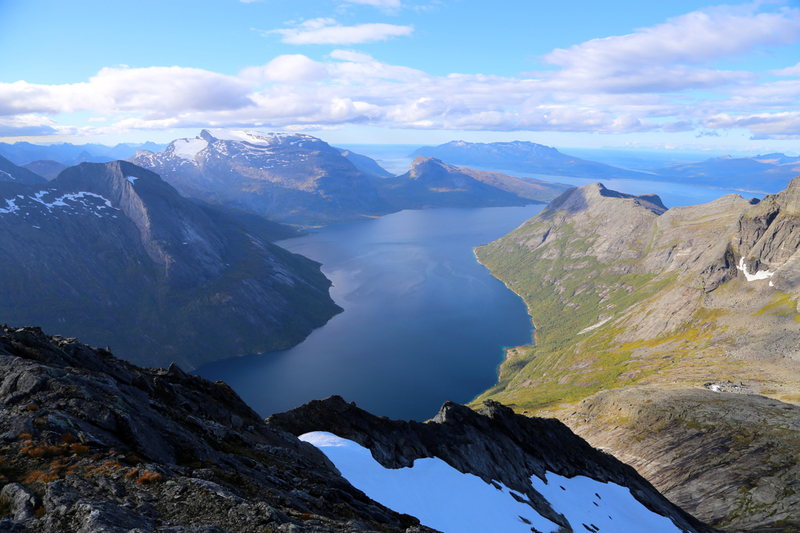 Mørsvikfjorden, as seen from the summit. The summit, as seen from the south side.